Founded in 1952, Bouygues is a french leading industrial group operating in nearly 90 countries. Its businesses focus on three sectors: construction, with Bouygues Construction (building, civil works, energy and services), Bouygues Immobilier (property) and Colas (roads), telecoms with Bouygues Telecom and media with TF1. In 2018, Bouygues generated over €32.9 billion. Bouygues Asia was established in Tokyo in 2002, as Bouygues Telecom outpost to set up a partnership with NTT Docomo. 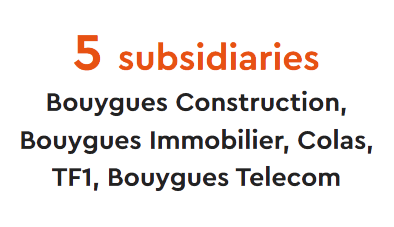 In 2015, the office diversified its activity to support the entire Bouygues Group as well as external clients. With a large network and a strong understanding of the local corporate culture, Bouygues Asia provides market insights and support by monitoring the latest innovation and tech trends. Bouygues Asia's office is located one floor below Place2B, which enables friendly interaction with all members. Everyone knows and helps each other to work, connect and create the perfect Place2B. © Bouygues Asia Co., Ltd. All Rights Reserved.